Most of the action was on the Ice Rink on Sunday, so the five of us walked into the Japanese garden, and stood on the bridge by the frozen waterfall. Great shots from the bridge below by our photographer! Our fingers got a bit frozen, but hearts were warm, and the chickadees came to comment on what we were doing. After a short ceremony and some great pictures in the snow, we hiked back to the Grenadier cafe for hot chocolate and the signing of the Marriage License. A memorable mid-day wedding to start the year. 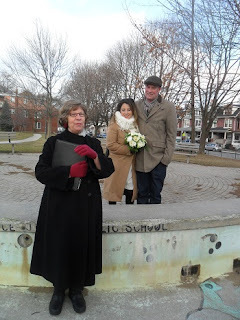 and then - a wonderful wedding by the empty wading pool in a Leslieville Park. I did take my gloves off, and so did the couple, to exchange rings. But we went inside to sign all the papers - I couldn't bend my fingers by then! I call this a red mitt wedding - where your nose matches your fingers! I think it would have been warmer with snow!